Ribbon-Cutting at Fish Point Park on October 24th! Join us for a ribbon-cutting ceremony at Fish Point Park to help celebrate the new water quality projects at the park! 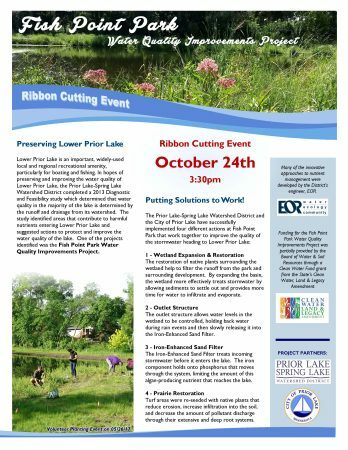 The Prior Lake-Spring Lake Watershed District has partnered with the City of Prior Lake to complete this important project aimed at maintaining good water quality in Lower Prior Lake.